Students will have fun creating a cardboard creation at home and bring these to display at the HCS sneak peak for others to use and enjoy. Watch video of examples for cardboard challenge. It is all about your children’s imaginations. We can’t wait to see what is brought in from home when school starts back in session. Why: Students will have fun creating a cardboard creation (or more) at home and display these at the HCS sneak peak for others to use and enjoy. 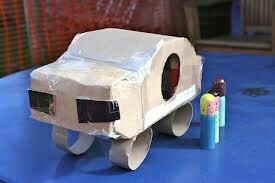 This will be a great family time for children to create something out of cardboard at home. Please bring the completed cardboard creations to Heartland’s Sneak Peek & New Family Orientation. They will be displayed in the gym on tables or on the floor depending on the size of the creations. Students can take their creations home at the end of the Sneak Peek.